Boys can enjoying wearing a variety of socks, from functional athletic styles to cool novelty ones, that are fun and stylish. Choosing the perfect pair will depend on the function, comfort as well as price. Socks can be found at a variety of retailers as well as online. Every boy needs a great pair of athletic socks, whether it is for gym class or to wear when playing a sport. Athletic socks are designed for comfort and many of the styles are made to wick away moisture. When shopping for athletic socks consider the fabric and features as well as length. Gold Toe Color Block Liner: These socks are sold in a pack with six pairs and are priced under $10. Not only do these socks come in fun color combinations such as royal blue with green and red with black, but they are done in a low height that will add a layer of comfort to any athletic shoe. These socks come in sizes medium and large. This style gets a five star site review for its comfort, quality and overall value. Buyers on Amazon also give the socks a 4.5 overall rating and had positive reviews on the durability, comfort, and style. The Gold Toe brand also gets favorable reviews for comfort and quality from Emily Reviews, and are said to have good quality for the price from Put This On. Gold Toe offers free shipping on all orders over $50 or will ship ground for $4.99. This retailer accepts returns within 45 days of purchase. Russell Comfort Performance Ankle Socks: Found at Walmart, these socks are priced under $6 and are sold in a pack of four. Color options include solid white, white with grey soles or black with grey soles. Sizes available are medium and large. These socks get positive reviews on the product page for being soft, cushioned and keeping feet dry. When shopping online at Walmart, take advantage of options such as free shipping to your local store or sending the item directly to the recipient. Returns can be made either at a store or by mail. 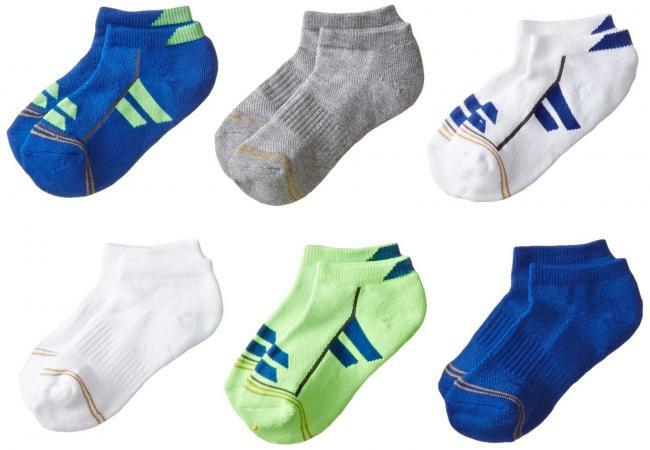 Adidas Cushioned Crew Socks: Sold on Amazon, these socks made from a blend of cotton and polyester are sold in a pack of three and are priced under $15. They are done in a crew height and feature ClimaLite to keep feet dry and to reduce odor. In addition, these socks are made with arch compression, welt cuffs and ribbing. They come in sizes medium and large and reviewers on Amazon state that they fit true to size. Color options include bright yellow, bold blue, power red and basic black. Consumer reviews on Amazon mention that these socks are great for the price, the colors are cool and that they work well for athletics. Amazon Prime members can take advantage of free two-day shipping, or shipped free to non-Prime members with an order of $49 or more. The site makes it possible to track your order and offers hassle-free returns. Dress socks for boys are essential to wear with a crisp pair of khakis, a suit or anytime you want to add some style to your boy's outfit. Dress socks can be found in classic colors such as black and navy as well as in subtle prints and patterns. Look for socks made in a length that reaches above the ankle to mid calf so that the top doesn't show when worn with pants. 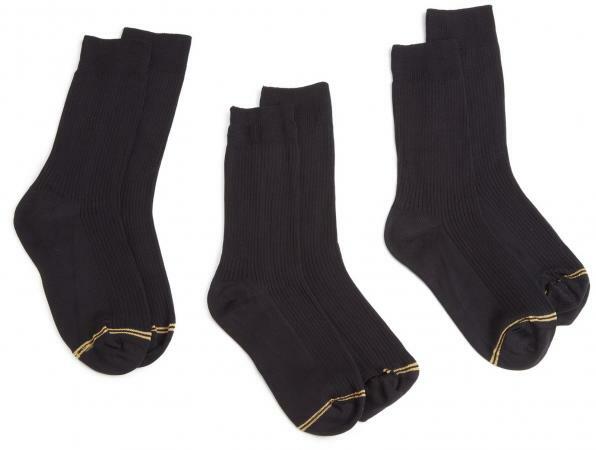 Gold Toe Fashion Dress Socks: These stylish microfiber socks, found on Amazon, are sold in a pack of three and are priced around $8. They are done in basic black and come in sizes small, medium and large. In addition, these socks have reinforced toes and heels to add durability as well as elastic cuffs to keep them from falling down. Customers who purchased these socks comment that they are done in a thinner material, making them ideal to wear with dress shoes, and that they are comfortable and soft. This item can be shipped free in two days to Amazon Prime Members. Returns are free and easy to do through Amazon. Ralph Lauren Dress Ribb Socks: Found at Macy's, these socks are sold in a pack of three and priced around $15. They come in sizes 2-4, 4-7, 8-9.5 and 9-11 and in classic colors including navy, black and tan. Each sock features the signature Ralph Lauren pony logo. Ralph Lauren is well-known as a trusted brand, and reviews on the product page mention that the socks are super soft, great with dress shoes and are high quality. Macy's offers free shipping on orders of at least $99 and has free returns. Flat rate shipping is $9.95. You can also choose to pick up your item at your nearest Macy's store. Gold Toe Patterned Dress Socks: Found at Kohl's, these socks will add a bit of pizzazz to any outfit. They are sold in a pack of three and are priced around $10. Each pack features blue and tan colors in patterns such as argyle, striped and solid. These socks have reinforced heel and toes and elastic cuffs making them comfortable yet durable. Site reviewers comment that these socks wear and wash well. One customer commented that her two sons love wearing them. If you are close to a Kohl's location, you can purchase this item online and pick it up for free at the store. Kohl's also offers free shipping on orders over $50 and offers hassle-free returns both in stores and online. You can add a bit of fun to an ordinary outfit simply by adding a lively pair of novelty socks on his feet. Socks can be found in endless designs, from holiday themes to sports teams and even in crazy colors. 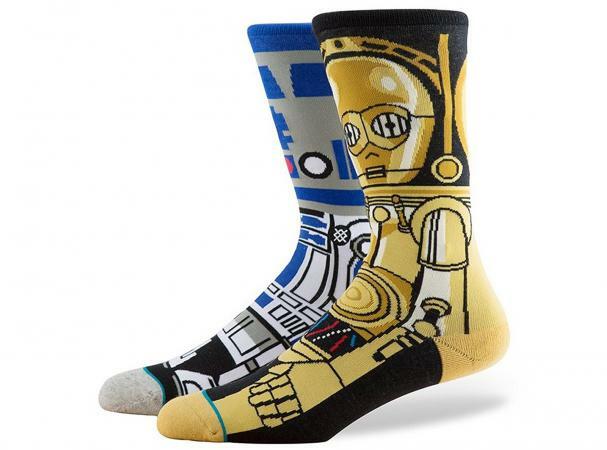 Droid Socks: From Stance, these cool Star Wars themed socks are priced at $16 and feature one sock of R2D2 and and the other with C3PO. These socks feature cushioning, an arch support and reinforced toes and heels. In addition, they are made of a combed cotton and have 200 needle count stitching making for a sharp image. Stance offers free shipping on orders over $50. A site review mentions that the customer would purchase this items again even though it is expensive. Reviews of the Stance brand on Wear Tested and Thither both give positive reviews regarding comfort, fit and style. Red Ninja Crew Socks: From Sock It To Me, these fun crew socks are priced at $9 and come in a youth size that fits up to a size 13. This style features a ninja design against a bright red background. One customer gave this style a rave review on the product page mentioning that her son loves the socks. She added that they are well made and nice and thick and hold up to hard wear. Another site reviewer mentioned that the site had fast delivery. The Sock It To Me Brand was also included as one of the brands in an article on the 7 Best Wacky Socks on The Cheat Sheet review site. Sock It To Me offers returns within 90 days of purchase. The site offers standard rate shipping through the US Postal Service as well as UPS shipping as an option. Orders can be conveniently tracked online on the site's tracking link under My Account. Superhero Socks: From The Sock Drawer, these awesome socks will be a hit with any boy. Priced around $9, they come in both youth and junior sizes. These bright blue socks reach above the ankle and feature red toes and cuff and bright yellow lightening streak on each side of the sock. Visitor comments on the brand's Facebook page praise the style, selection, and customer service. The Sock Drawer offers free shipping on order over $35 and First Class USPS shipping at $3.95 on orders under $35. Returns are accepted within 30 days of purchase on unworn items only. Scroll down the home page and check out the latest review from a happy customer. One customer mentioned shopping on the site was fun and that she couldn't wait to shop again. With the wide variety of socks available for boys, there is no need to settle for uncomfortable and boring. You can choose socks that are fun to wear and will be ideal for a specific function. Socks can either add a subtle touch to any outfit or a bold pop of color and fun.